I recently took an amazing trip to southeast Alaska and explored sites in the region known as the “inner passage.” Here, I’ll share some of the sites I saw that are not only fun and fascinating, but there is a science and societal (cultural) relevance that make these appropriate subjects to bring to my students in my courses. While on this journey, I was also a Guestgrammer on the American Geophysical Union’s Instagram account (@americangeophysicalunion), so I’ll include some of those posts here as well. 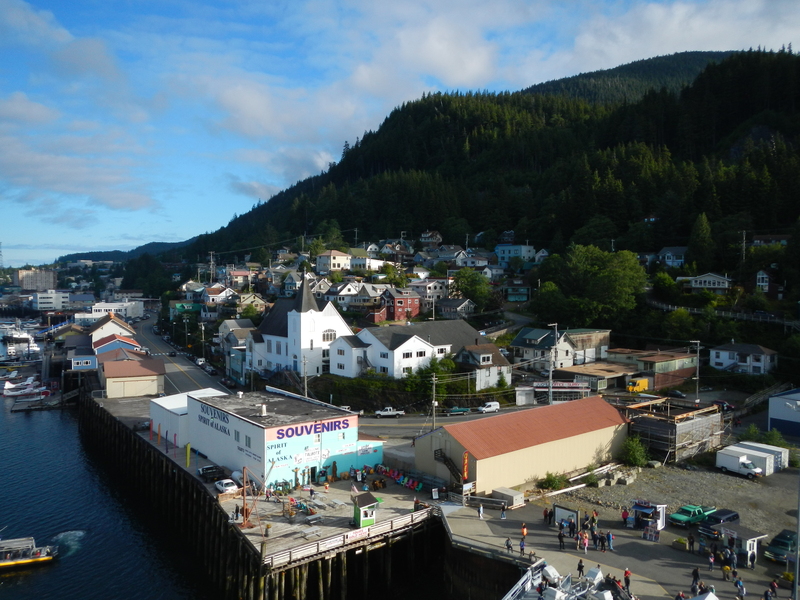 I had never heard of Ketchikan, Alaska, before arriving there – and you can only arrive on this island by boat or by plane. (In fact, one of the Ketchikan residents was joking with us that there are no car thefts on the island – there is no place to take a car once it is stolen!) Ketchikan is known for the largest collection of totem poles in the world and as the rainfall capital of the United States (in fact, of all of North America), receiving on average 160+ inches of rainfall per year. This constant source of rainfall allows Ketchikan to also have a piece of the largest old growth temperate rainforest. The Alaska Rainforest Sanctuary (http://www.alaskarainforest.com/) was a wonderful place to explore not only this amazing landscape, but it was also a place where we saw bald eagles, black bears, and banana slugs! In fact, this is the location of the second largest rainforest in the world, and Alaska is home to 50% of the world’s population of bald eagles. Here are a few snapshots of the amazing scenery. I don’t know the story behind this pole – would love to know why the octopus is having its tentacles all severed! One additional surprise for me in this location was not as much the presence of all the totem poles, but the amazing symbolism and stories that the totem poles have to tell. At the Alaska Rainforest Sanctuary in particular, there is a Tsimshian from the Native community of Metlakatla that is carving poles with wildlife and legends of the region. I noticed that several of the poles have stories relating to the ocean – I can’t wait to bring these pieces of art and their stories into my oceanography course next time! I hope to get back to Ketchikan again in the future. It was the 4th of July when we visited, so it was difficult to get around the small town with everyone out for their 4th of July parade. But after exploring the rainforest and catching a lumberjack competition, we were off to our next destination!